Gustav Mahler died in Vienna in 1911. The famous composer had a hate/love relationship with a young music prodigy, Arnold Schoenberg. Distant at first they eventually grew close enough so that in 1910 Mahler paid a year’s worth of rent for the struggling younger composer. 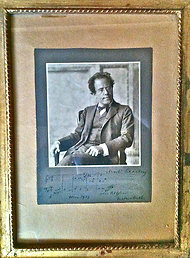 In 1907, Mahler gave an inscribed photo to Schoenberg which, perhaps, disappeared in the 1980s, or earlier. The $350,000 photo has now resurfaced and is the subject of a collectibles dispute between the Schoenberg family and heir of a music memorabilia collector. Schoenberg died in 1951 and his wife, Gertrude died in 1967. This one has all the classic themes present in many fine art disputes. The collector claims that his grandfather was close to Schoenberg’s circle and that Schoenberg gave the Mahler photo to the collector’s grandfather. Let’s suppose that is true. How does one prove the gift by Schoenberg to the collector grandfather if made over 60 years ago? The evidentiary burdens required to prove a gift can be formidable. After all, a gift is a selfless and almost unnatural act. That’s why the law looks upon the act of making a gift with skepticism. What further complicates matters is that the act of gifting often occurs out of sight, without the knowledge of others and with the intent to the keep the transfer confidential. Moreover, in many states evidentiary rules, such as the Dead Man’s Statute, preclude evidence offered by the gift recipient when the deceased grantor is no longer available to offer contrary evidence. In other words, these are the three strikes against proving a valid gift: 1. It’s an unnatural act that the law looks upon with skepticism, 2. It frequently occurs out of sight of others; and 3. Evidentiary rules throw obstacles in the way of proving the gift after the grantor has died. This doesn’t mean that gifting is unprotected. Quite the contrary. The law recognizes the right of anyone to give their property away. However, proving the gift as valid, sometimes many years after the fact, can be very difficult. So, the moral on this point: Gifts should be substantiated in some manner. A simple side letter confirming the gift, which can likewise be held confidentially, may sometimes suffice. However, the case is no lock for the Schoenberg family either. The sympathies of Schoenberg scholars are with the family claiming that Schoenberg attached such value to his relationship with Mahler that Schoenberg would never have simply given the photo away. But sympathies alone cannot turn the tide in a fine art/collectible litigation. The family claims that they first discovered that the picture was missing in the 1980s and alerted the University of Southern California, which, at that time was holding the Schoenberg archive of memorabilia. However, an inventory of the family collection in the 1970s does not list the photograph. So, the family has its own burden to prove title and provenance (that is, ownership) and it would also help if they could claim that some fraud or theft mechanism arose pursuant to which the photo was taken. That’s tough to do with few existing records and with the principal characters having long ago died.